A brief guide to sports involving horses in the UK. 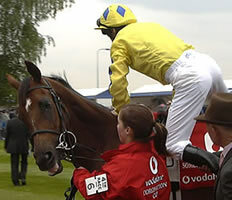 The main racing newspaper is the Racing Post: http://www.racingpost.co.uk. 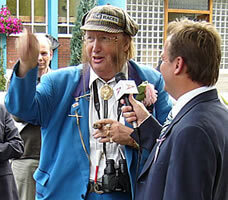 The main racing events are shown on television on BBC1, BBC2 or Channel 4. The most important flat races are five 'Classics': the 1000 Guineas and 2000 Guineas (at Newmarket, in May), the Oaks and the Derby (at Epsom, in late May or early June; see: Ideas/Events/May or Ideas/Events/June) and the St Leger (at Doncaster in September). For photos from the Oaks and the Derby, see: Ideas/Album/DerbyDay. Royal Ascot (at Ascot, in June) is a famous 5-day flat racing event attended by members of the royal family. Ladies' Day on Thursday is also famous for fashion (especially the hats worn by ladies). The official website is: http://www.ascot.co.uk. For photos from Royal Ascot, see: Ideas/Album/RoyalAscot. The main jump races are the Cheltenham Gold Cup (at Cheltenham, in March; http://www.cheltenham.co.uk) and the Grand National (at Aintree, in April; http://www.aintree.co.uk). Tickets to the most famous races should be bought in advance from the racecourse. For ordinary events, it is usually possible to buy entrance tickets on the same day. There are normally three areas where you can watch the race. 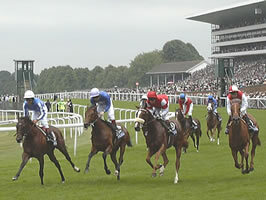 The members' enclosure is the most expensive area of seating (nearest to the winning post) and the dress code is formal (men have to wear a jacket and tie); only regular members can get tickets here at the most popular events, but it is possible to be a day member at most other race meetings. Tattersalls is the second most expensive area of seating and is a little less formal, although it is better to wear smart clothes (not jeans, for example). The cheapest tickets are in the silver ring (from here you cannot see the horses parading before the race or the winner's enclosure after the race). Newmarket is the largest training centre and is the home of the National Stud (a centre for breeding thoroughbred horses) and the National Horseracing Museum. To visit it from London by public transport, take a train from King's Cross to Cambridge and take a bus from the station to Newmarket. 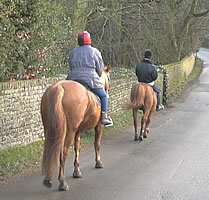 There is a long tradition of horse riding in the UK, and many paths in the countryside where horses can be ridden (these are known as bridleways). A riding school is a place where you can learn how to ride a horse. A livery stable is a place where horses are kept or hired out for money. 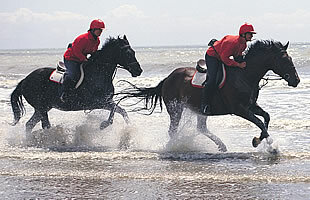 An equestrian centre offers both riding and livery. , enter a postcode or town name, select Find by category and choose Sport & leisure then Sports coaching & instruction then Riding schools, livery stables & equestrian centres. The nearest ones will be listed first. 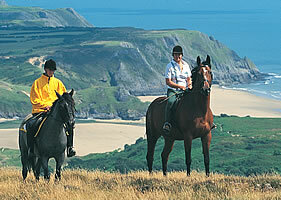 If you would like to take riding lessons, you may want to choose a school which has been inspected and approved by the British Horse Society (see the "riding schools" section of http://www.bhs.org.uk) or by the Association of British Riding Schools (see the "approved riding centres" section of http://www.abrs.org; if you are living in London, you should check the list of members in London, Middlesex, Hertfordshire, Essex, Kent, Surrey and Buckinghamshire, because many riding schools are located in the "green belt" area just outside of the London area). In central London, the most well-known location for horse riding is Hyde Park and Kensington Stables (see http://www.hydeparkstables.com). Often the school can lend a riding hat to you. You should check what sort of clothes you should wear (formal riding clothes are not usually required, but long trousers and strong boots with a heel will be necessary). Expect to pay between £15 and £35 per hour for group lessons or rides in the countryside (one-to-one lessons can cost between £25 and £60 per hour). Riding can be dangerous, so check that your insurance will cover you in case you have an accident. There are many areas of Britain which are suitable for trekking. One of the most popular locations is in Wales - for example, in the Brecon Beacons or Pembrokeshire Coast national parks.